The Ghost Trap Group Read Giveaway!! The haunting story of a young lobsterman, Jamie Eugley, who is struggling with the grinding responsibilities of a head-injured fiancée and mounting trap wars. 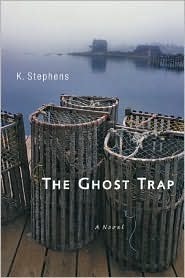 Written with sensitivity and rich description, this is a piercingly accurate depiction of life in a small Maine lobstering community. Leapfrog has generously made 10 copies available for giveaway! 1 - Post a comment here stating your interest in the novel, whether you are international or a US resident, and leave me a way to contact you. If your comment is missing any of this information, it will be considered ineligible. 2- Agree to participate in a group read book discussion that will run during the month of April over at TNBBC on Goodreads. K. Stephens has agreed to participate in the discussion and will be available to answer any questions you may have for her. By commenting, you are agreeing to read the book and join the group discussion at TNBBC on Goodreads (the thread for the discussion will be emailed to you at the first of the month). It's first come, first serve so the first 5 international commenters, and the first 5 US commenters will secure a copy for themselves for the group read. The contest ends when the last copy of each set of 5 has been claimed. However, if you are not a winner, no worries. You can purchase a copy of the novel or simply join in on the discussion to ask K. Stephens questions about the writing and publishing process... All are welcome! Whoo hoo.. You got it, Erica! Thanks for the interest. An email will be sent out once the other copies have been claimed. I would like to read The Ghost Trap and participate in the the group discussion in April. Hi PoCoKat! You have locked in an international copy! Lori, I'd love to join in the fun! I have been a bad, bad girl, not spending nearly enough time over at TNBBC, so this is a good way to get me back over there!! I am a US reader and solemly swear to participate in the group thread on the book (which sounds very cool, I might add!) I can be reached through my email, booklover@myself.com. Thanks to you, K. Stephens, and Leapfrog for a lovely giveaway!! 3 US copies left, 4 International. I live in Israel. This book sounds interesting to me. Would love to participate in a discussion! Of course I will take a copy!!! I would be honored! I am a US resident as well!!! Rena, excellent, a copy is all ready for you! And Donna, you as well! Oh, me! I'm a US resident. And a member of TMBBC, so I'll be at the discussion. LoudQuietGirl - you snagged the final US copy! only 3 international copies left!!! If the international copies don't end up being taken, I'd like one! I'm also a member of TNBBC, so I'll be there. Ok Danie... you want it, you got it! I would love to get a copy if one is still available. Im available for to discuss and review it :) Gotta love being on vacation. Oh sorry If I did a couple of reposts, I was doing over my phone, but its been acting up lately. Hooray Jason, you got the second to last copy! I love that I am getting some interest from newer members! I'd like a copy, i'm international and i agree to join April's book discussion. Hi Ron, sadly, all of the copies were claimed at the beginning of the month. But thank you for the interest. In the future, an email is preferrable as a way to contact!